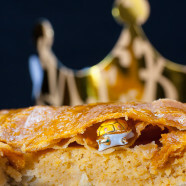 Kids love this Joyous King Cake the whole year and is a lot of fun for the whole family! 1 vanilla bean Cut vanilla bean in half lengthwise. Bring milk with vanilla bean to a boil. Remove from heat and allow to soak for 10 min. Using the tip of a knife, strip down vanilla bean on a wooden board, add seeds to milk. Medium heat / 5 to 10 min Using medium heat combine vanilla milk with yolk honey mixture in a pot, stir constantly till slightly thicken. Remove from heat, leave to chill. 1 tbl starch Using a wooden cooking spoon combine butter and honey. Add almonds, starch, rum and eggs to a smooth mixture. Filling Crème : Combine pastry creme with almond creme and refrigerate. 1 tbl acacia honey Cover baking sheet with grease parchment paper, put one slice of puff pastry on top. Using a fork broach pastry. 1 little figurine (porcelain figure) cut slices of 2 mm (3 cm away from the edges) spread evenly. Put figurine on top. Cooled Frangipane Cream Cover pears with the refrigerated filling creme. Moisten the border of the pastry, top with second round of puff pastry and press down the edges to seal. 1 Tbsp acacia honey Brush the pie with acacia honey. Using the tip of a knife, score lines across the pie. Prick the galette with a fork. Bake the pie for 45 minutes. When the top is golden, turn the pie over onto another tray covered with buttered parchment paper. Brush the top with honey and bake again till golden. Let stand 1 hr before serving After removal from the oven, let stand at room temperature for 1 hr before serving. The warm pie is delicious and flaky. For a traditional french Galette des Rois, follow the same instructions omitting the pears. The pies are always more delicious when warm. If the pie is cold, warm in the oven for 10 minutes before serving. The one who gets the piece with the little porcelain figure is the ‘king’. One of the kids sits under the table and appoints who gets the next piece – that increases the tention and is a lot of fun!